Every Tuesday and Wednesday during the month of May, we’ll be hosting a gluten-free guest blogger from around the web in honor of Celiac Awareness Month. Kicking things off today is Amy Leger, Family Editor for Gluten-Free Living and owner of TheSavvyCeliac.com. This is part one in a two-part series in which Leger will share her favorite tips that learned from years of interviewing gluten-free experts. Part one is about cooking and eating gluten free; check back later in the month for part two, which is all about gluten-free kids and families. When my daughter was diagnosed with celiac disease 15 years ago (this month) I was in shock. I wasn’t a great cook and I most certainly didn’t pay a lot of attention to ingredients in the food that we bought. Plus, in 2000, there was little information available for folks with celiac disease, and the people who love and care for them. Any educated hints and tips I could get were always highly welcomed. 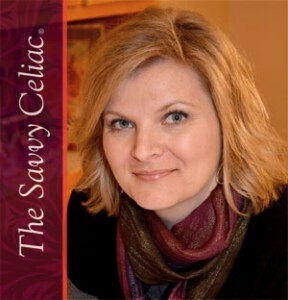 While I am the Family Editor for Gluten-Free Living, I also I write for my website TheSavvyCeliac.com. And during the last several years I have had the pleasure of interviewing a lot of people who have a lot of great advice. Here is part one of some tips from the experts I thought you might find helpful as well! And what should gluten-free athletes eliminate? “Anything that is made of highly-refined gluten-free starches and has a lot of empty calories in it,” Bronski said. Amie Valpone is gluten free and is the founder of The Healthy Apple. We talked in early 2014 about eating healthy while maintaining a gluten-free diet. Specifically, I wondered about recommendations to help our gluten-free children eat healthier when we are on the go. Ten Dollar Dinners host Melissa d’Arabian has a daughter with a gluten sensitivity. While she is very busy working on her Food Network program, she makes time to cook food for her family and save a bundle at the grocery store. I interviewed her after she wrote her book Supermarket Healthy last year and asked if it was even possible for gluten-free folks to save money when they shop. Cookbook authors and gluten-free eaters Jessie and Jillian Legasse spoke at the 2014 Gluten-Free Living Conference and offered some other great tips about adding moisture to your recipe.They say to let your gluten-free dough rest at least 30 minutes to as long as overnight because gluten-free flour doesn’t absorb moisture as quickly as regular flour. With these quick tips, you’ll be able to eat healthier and make better and less expensive gluten-free food. Amy Leger is the family editor for Gluten-Free Living and has her own website TheSavvyCeliac.com. She lives at home in Minneapolis with her husband and two children, one of whom has celiac disease.